Book a presentation for your school or business now. Introduce a student to the world of wheelchair sports. Trooper Johnson was paralyzed in a car accident when he was 17 years old as a result of a drinking and driving accident. 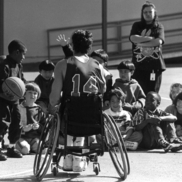 Since then, he has been a member of the United States National wheelchair basketball team for 15 years, competing in four Paralympic Games, he became the 2nd paraplegic to climb El Capitan in Yosemite Valley, CA, he (along with two teammates) pushed his wheelchair from San Francisco to Los Angeles, and he is the Youth Sports Program Coordinator for the Bay Area Outreach & Recreation Program, providing sports and recreation opportunities for kids with physical disabilities. Trooper's interactive wheelchair basketball presentations challenge students to understand the abilities of a person in a wheelchair. These presentations include information to break down stereotypes associated to individuals using wheelchairs, and offer frank discussion related to drug and alcohol prevention.